After successfully completing the FLEX program, Ukrainian FLEX alumnus Oleksandr Kushch’13 (Kharkiv, Ukraine/ Austin, TX) has chosen not to remain idle. Though busy studying at the National Law University of Yaroslav the Wise, Oleksandr always finds time to work toward developing his community. Oleksandr is one of the founders of the NGO Our Deal and organized the project Academy of Future Elected Officials. The idea of the Academy of Future Elected Officials project was to introduce talented young people who see their future in politics to the knowledge, skills, and opportunities they need to make that dream a reality. The 70 participants selected from more than 200 applicants attended lectures, workshops, and seminars led by well-known lawyers, political leaders’ assistants, political strategists, and successful public speakers. The classes taught the participants about different aspects of political campaigns, political strategies, public speaking skills, and leadership. After each class, participants were assigned homework on a topic that they subsequently would present and debate with their opponents. Some of the topics discussed include: Public Relations in Campaigns, Youth in Politics, Political Debates, and Public Relations in Social Networks. The participants received points for completing their homework, and attending and actively participating in classes. After tallying the scores, four participants became finalists of the project, with the overall winner receiving an offer to fulfill an unpaid internship as the assistant of a local deputy. The winner will also be able to run in future elections as a member of the Ukrainian political party “Batkyvschyna” (“Fatherland”), which supported the project. One program participant was quoted, “The project helped me discover myself as a true citizen, while also allowing me to discover what my strengths and weaknesses are. Through tough competition, patience, and enthusiasm, I realized the strengths I can bring one day to a government office.” – comments the winner of the Academy of Future Elected Officials, Anastasiia Marchenko. Organizers believe that the project benefits participants and the community in which they live. Oleksandr plans to continue the project and develop it further with the members of the NGO Our Deal. 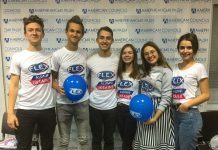 Oleksandr’s enthusiasm and willingness to work for the betterment of society show how FLEX inspires its participants to go on to do great things!